When we think about science, we often think about people in lab coats, standing around recording tiny measurements. But a huge amount of science happens in the field—that is, out in the world. And a lot of that science is pretty weird. 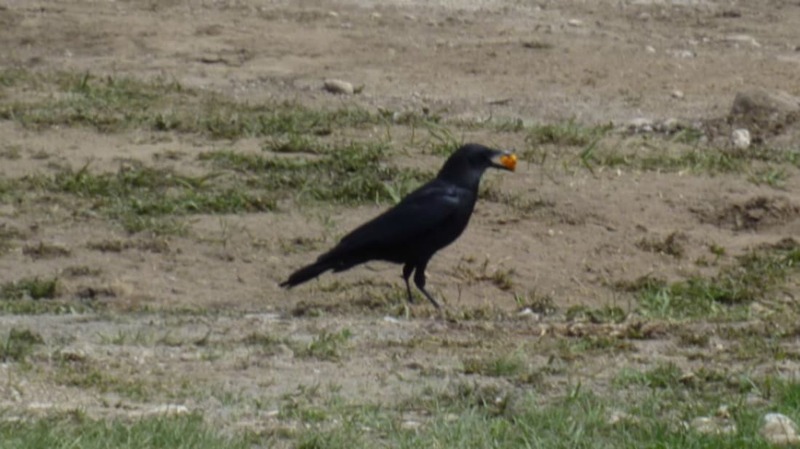 Take, for example, a set of recent experiments on wild crows and magpies in Jackson Hole, Wyoming, that had the birds competing for Cheetos. The results of these experiments were presented at the 101st Annual Meeting of the Ecological Society of America. Corvids (the family of birds that includes crows, ravens, and magpies, among others) are famously savvy creatures. They’re schemers to the core, using and making tools and exploiting other animals to suit their needs. Magpies, for example, will nest near larger species like crows, counting on the presence of the big birds to scare off any would-be attackers. The two species share similar diets, a fact that made ecologist Rhea Esposito wonder. The larger birds are “notorious nest raiders,” she said in a press statement. Wouldn’t crows just make off with the magpies’ food? Is keeping big, hungry birds so close to the nest really worth it? To find out, Esposito staged a set of tasks for the birds centered around a primo prize: Cheetos. They’re “…not the healthiest food, but the birds like them a lot," Esposito said. "And because they are bright orange, it was really easy to observe when the birds completed the task." After identifying the nesting sites of breeding pairs of magpies and crows, Esposito set up Cheeto puzzles of varying levels of difficulty. At first, she just left a few Cheetos out in the open near each pair’s nest, watching to see what the birds would do. Next, she tucked them inside a nearby hollow log. To extract their snack, the birds had to figure out to pull a string, which Esposito admits was “just a blast to watch.” And all the time the birds’ brains and beaks were working, Esposito was timing them, recording them, and taking notes. The two species took very different approaches to the crunchy, orange wonder in their midst. Magpies flew down to check out the Cheetos almost immediately, around 20 seconds faster than crows. The crows were warier and waited longer before testing the bait. But once they’d figured out that the Cheetos were food (in a manner of speaking), they were three times more likely than magpies to grab them and go. "These puzzles were very simple for corvid abilities,” Esposito said. “They have solved much harder problems in the lab. But this was one of the first such experiments with wild birds and I was more interested in the ecological than the cognitive questions." The birds had performed admirably thus far, but Esposito decided it was time to crank up the competition. She set out new Cheetos bait smack in between two nests—one belonging to crows and one belonging to magpies—and sat back to watch the mayhem. With other animals, this might have been the beginning of a blood bath. But these are corvids, which means they’re more prone to playing mind games than picking fights. And that’s exactly what happened: the crows started using the magpies. At first, the crows would wait for the smaller birds to arrive and test the bait. Once it proved to be edible and the coast was clear, the crows descended and bullied the magpies into leaving. After a while, Esposito said, the magpies just stopped trying. To the magpies, she says, that cost is apparently worth it.